In June 2017 this Reflex Korelle B came up for auction. Covered in dust, non working but the plating looked to be intact and it all seemed to be there making it a good choice, and no one else was interested in it. Most collectors concentrate of the Reflex Korelle I or II models, the B is a bit ignored. Essentially a cut price Reflex Korelle 1, they are rarer than their brethren as they were only made for a year or so, after 1937. It's actually a fairly simple device, built around a die cast aluminium shell that is commendably thin and light. 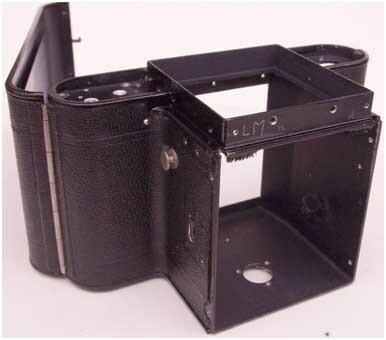 It attracts interest as it's an early 6x6cm format SLR. Upon arrival it was evident that the shutter curtains had gone stiff and were breaking down. Having been parked in the same position for decades the shutter curtains were creased around the guide rollers, also making them stick. The springs felt healthy, however, and there weren't any missing parts to worry about. Cosmetically, there was some scratching, a bit of rust and the covering was peeling. As ever the camera was photographed before stripping it down. I took a chance with this one, clearly the lens was covered in dust, and the risk of fungus is very real under those conditions. I had to resist the temptation to clean it off straight away. 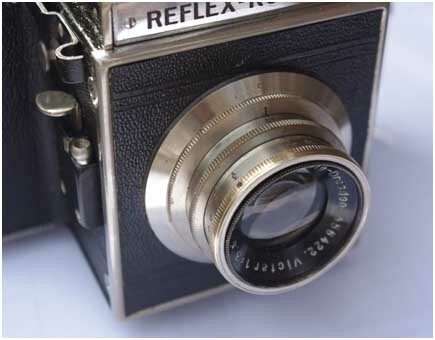 The Reflex Korelle has a mixture of chrome and nickel plate. From what I can tell the pressed steel top and bottom are chrome plated over an intermediate layer of copper, whilst the nickel plate is plated directly to brass components. These reflex Korelle's come apart quite painlessly. 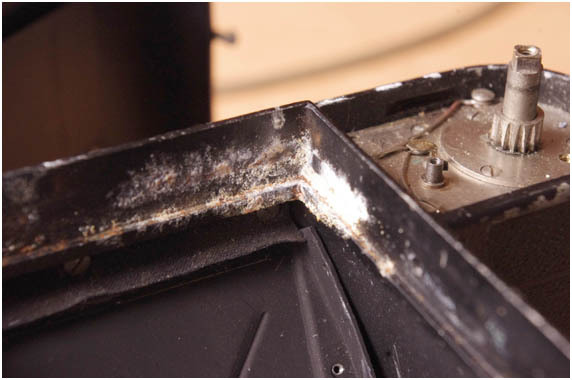 They are mostly screwed together, but there is a need to remove some of the covering to gain access to the screws, but apart from that present few difficulties. 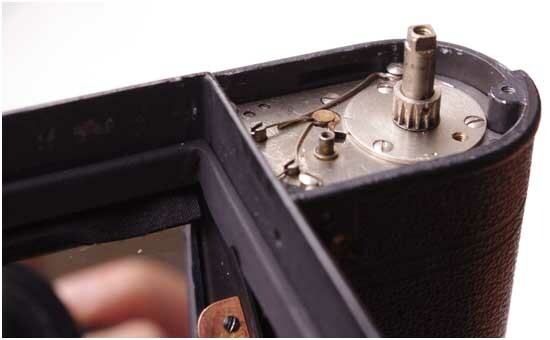 This plate upon which is mounted the wind on knob, film counter also holds the shutter rollers and guide rollers in place. The plate is thin, so all screws need to be removed as they pass through it to be threaded into the shell below. As a consequence the shell is extensively drilled and tapped. The film counter window is just a hole, over the decades dust and muck has found its way in. 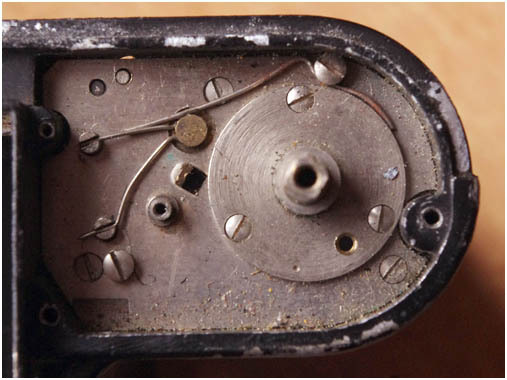 The wires you see are, at the top, the spring that keeps the film counter engaged and the other two are the spring steel anchors that keep the internally sprung shutter rollers in tension. Aluminium rusts like steel, except that it produces this white oxide. This needs to be removed, as it is very fine and abrasive. It will find it's way onto the film for sure. To be certain it's gone, scrape back to silver metal, polish and repaint, matt black in this case as it's inside the mirror box. I removed the surface silvered mirror prior to disturbing the oxide to stop it falling on the mirror. The mirror was in near perfect condition with only tiny marks and I wanted to keep it that way. Measuring the thickness of the shutter cloth. It was apparent straight away that new shutter curtains would be needed. 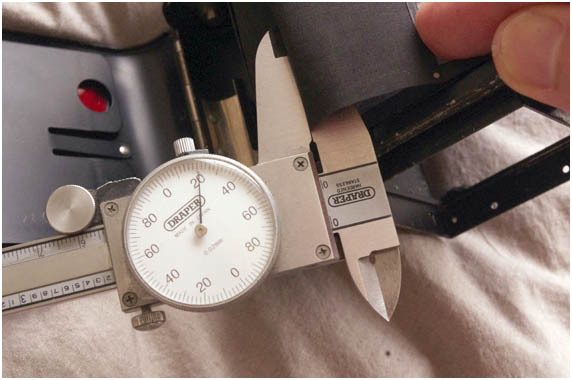 It's important the replacement cloth is the same thickness, as this has a bearing on shutter travel as the cloth bulks up on the rollers. Fortunately I had just enough cloth of the correct gauge in my spares bin. 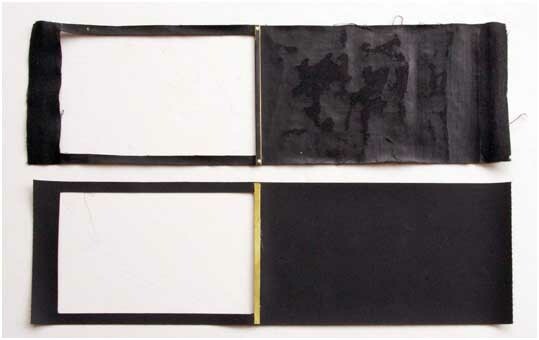 Over time the cloth becomes stiff, mainly due to the hardening of the rubberized water soluble paint used to seal it. The paint was applied by hand to the cloth and you can often see the brush marks in these early shutters. After eighty years most of these early cloth shutters will have tiny holes in now, known colloquially as pinholes, these will allow light to fall onto the film rendering the shutter useless. 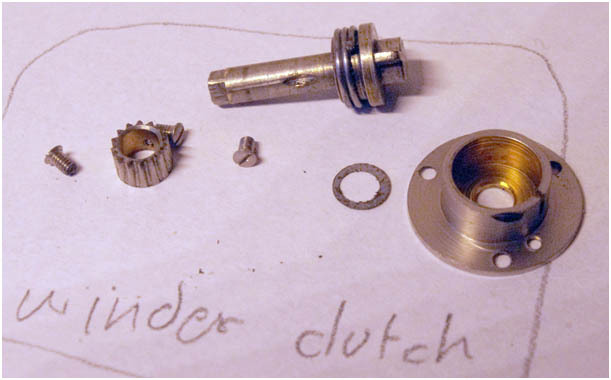 The camera was completely dismantled to its component parts. I use a clean sheet of paper and lay out each sub assembly in sequence, making notes on the sheet against each pile of parts. Sometimes drawing around a component and marking which screws go through which hole. 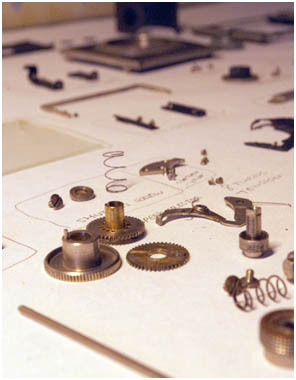 Notes such as the number of turns a spring had as it was removed, anything that might be useful later. These cameras are well thought out and follow conventional practice, and are simple enough to work on. Being 120 format means that everything is a decent size and not too fiddly. 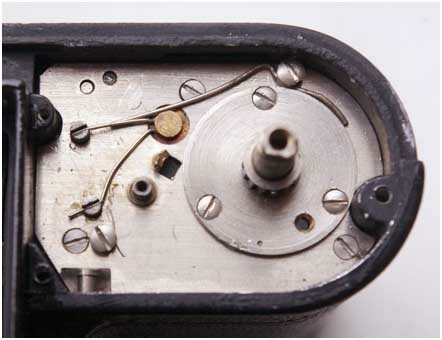 The simplicity of this camera is illustrated here as this is the entire shutter speed setting mechanism. 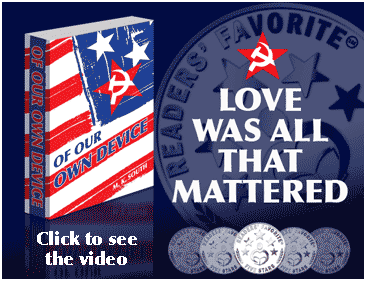 I have read that the gears were stamped crudely. But that's not the case these gears are definitely cut, or ground. The mechanism was gummed up and sticky which was placing too much drag on the second curtain, but otherwise perfectly serviceable. The Reflex Korelle is in fact very competently made, not as refined as an Exakta, granted, but another worthy camera to have come out of Dresden. Having photographed the start and stop positions of both curtains before removing them, it was fairly simple to set them up again after the replacement curtains had been made. These are the base pivot plates that hold the shutter curtain rollers and guide rollers. It rather looks like the person making them had an off day, the right hand plate has a hole in the wrong place. Or maybe they are replacements. Either way, they are both reusable after a good clean. 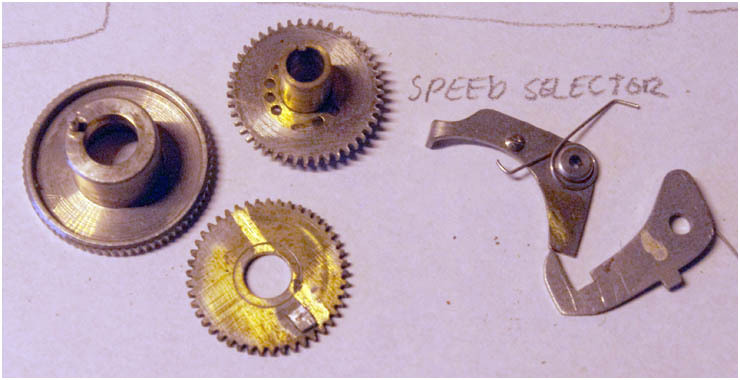 Even the spring clutch in the winder mechanism was taken apart and cleaned. It now moves with a silky smooth friction, as opposed to the gritty stiffness of before. This shows the old second curtain, top, after removal alongside it's replacement. You can see that the light proof coating has broken up and become stiff. The leading edge is kept straight with a thin sheet of brass folded over to pinch itself tight onto the curtain, as is common practice. 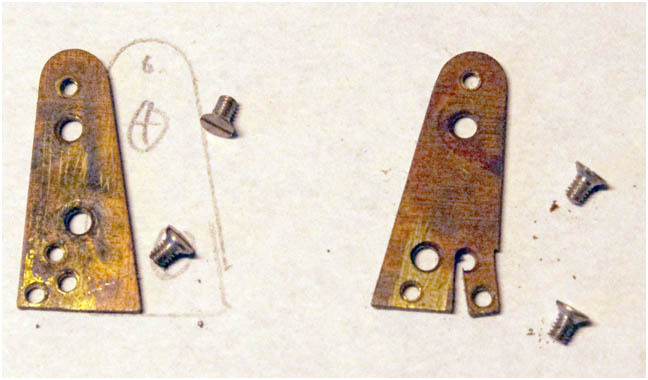 The original has flush rivets at each end. I chose a different method as I don't like to put a hole in the weave at the point it undergoes most stress - a drop of cyanoacrylate does the job admirably and actually strengthens the material at this point. Some makes of camera with cloth shutters have separate strong tapes top and bottom, but ones like this rely upon the strength of the warp. The new brass leading edge strip was subsequently painted matt black. The first curtain was made in a similar fashion, then glued onto the original shutter rollers. The rollers themselves are anchored to their cores with tiny grub screws. The shell was tidied up, first by removing the corrosion, then a good wash and clean of the faux leather, a thorough clean inside and out then selective repaint. The idea here was not to make it look like new, just to make it tidy again. The initials scratched in the front plate form part of its history, so are retained. Here it is just about to have the newly made shutter installed, along with the refurbished internals. This camera also has an improvised red window that's been added in the back. As it's reasonably well done and forms part of the camera's history, this too has been retained. The two shutter curtains are significantly different. The second curtain is longer and has to pass over two tight 90 degree turns around two small diameter rollers. As received, two of these guide rollers were too stiff to roll freely. At the moment I have 12 turns on the first shutter curtain and 16 on the second. This may need to change but audibly sounds okay for now. The first test film will reveal the truth. The lens cleaned up well, showing few effects from the dust. Very little had penetrated inside and there was no sign of scratching or fungus etching, a definite result! The Nickel plate cleaned up well and the focus and diaphragm controls are smooth once again. It took just under a week of evenings to resurrect this camera in time for its eightieth birthday. Possibly not the most attractive camera ever made, it might be kindly described as "distinctive". The reflex finder is comendably bright, but the lack of a magnifier on the cut price B model is a compromise too far in my opinion. 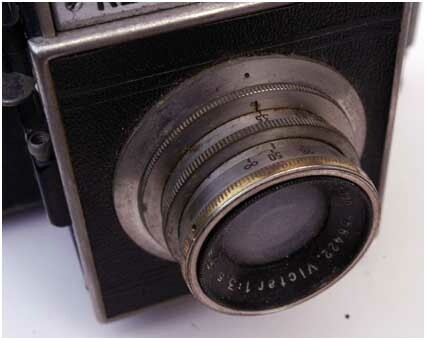 The shutter release is light, but the camera would benefit from being tripod mounted as there is a tendency to displace the camera unless gradually raising the mirror, which in turn triggers the shutter. Part of the reason for this is a fairly strong mirror return spring. The spring is designed to be firm enough to prevent the mirror moving when in transit, otherwise there is a risk the shutter may release if left tensioned. You can see the camera here in all it's 360 degree glory.